A medical engineer and an astronaut work together to survive after an accident leaves them adrift in space. In my opinion, the key to making special effects convincing onscreen is designing the effect to look somewhere between real and unreal. When the audience can’t figure out what’s real and what’s not, they will believe it. This is what happened to me during Alfonso Cuarón’s Gravity. Since Children of Men, Alfonso Cuarón takes his love of the long take and brings it to new levels. I couldn’t figure out how these long shots were accomplished. The camera floats freely around the astronauts in space in long takes, occasionally shifting from third person perspective to first person. The camera loops, twirls, corkscrews around space, completely forgoing the human sense of up and down. It looked like the cameraman was really floating around with the actors. I knew that wasn’t possible. But eventually I tapped out and let the movie spectacle just wash over me. As science fiction thematically explores the extreme potential of mankind, awe is an important component to every science fiction story. 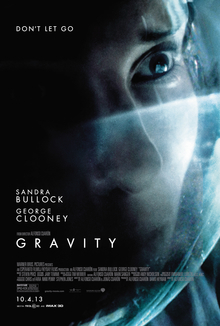 I was in sheer awe through the entirety of Gravity. Firstly, outer space and the beauty of Earth from a distance awed me. Then there was the solemn beauty of witnessing the space stations being decimated in space. I began to marvel at the destruction and momentarily thought deep thoughts. It was as if for a second I was watching waves wash ashore on a beach while reading J. Krishnamurti. Finally, I was awed by the fragility of human life. After all, all astronauts are just little fishes trying to survive out of their own habitat. The experience was otherworldly, self-reflective and dangerous all at the same time. I walked into Gravity mistakenly thinking it was a George Clooney vehicle. To my surprise, it’s a Sandra Bullock movie. Sandra Bullock has always had a natural personable quality onscreen. Whether it was pining for her crush to awaken from a coma in While You Were Sleeping or driving a bus that’s primed to explode in Speed, she’s always able to draw the audience into her plight with vulnerability. Bullock’s characters never feel above the audience. Often this quality of hers get overlooked from having to play cheerful funny characters in romantic comedies. And for that, Gravity is a great gem and one exhilarating thrill ride. I am even happy that it was a great role for Sandra Bullock. I just do not know if the thrills will be as compelling on subsequent viewings. So in the end, it is not a masterpiece, but very awesome nonetheless. After visiting Mont Saint-Michel, Marina (played by Olga Kurylenko) and Neil (played by Ben Affleck) come to Oklahoma, where problems arise. Marina meets a priest and fellow exile, who is struggling with his vocation, while Neil renews his ties with a childhood friend, Jane (played by Rachel McAdams). To the Wonder is the most Terrence Malick-y out of all the Terrence Malick films I have seen (The Thin Red Line, Tree of Life thus far). The tranquil characters run around playing with each other or stare angrily at each other to give the silent treatment. Every action, expression or object is an inner feeling, trying to evoke sense memories like a glossy choppy nonsensical Prada perfume commercial. For example, a couple racing through a grass field playing tag evokes one kind of feeling, whereas the same couple embraced looking at each other grimly by a living room window evokes another. People in real life do not behave this way but it doesn’t matter. It’s the overall sum of how everything feels. The way To the Wonder is told makes it impossible to say anything about the cast or performances. The actors are mere colors being applied on a bigger canvas. Malick’s trademark whispering voice-overs are our only true source to what these characters are feeling. To go off a tangent for a second, the use of voice-overs is usually frowned upon in screenwriting. Screenwriters are often snotty about this, but Terrence Malick applies them well. Yes, it’s an easy device to telegraph how a character is feeling at any point in the story and that can easily be cheapened. However, god is in the details and one should access thesubtextual use of voice-over in contrast to the supertext. The actors are all taciturn and physically performing their emotions to the point that the voice-over is the dialogue. It’s that combination of choices that creates the ephemeral feeling that we’re seeing inside the character’s souls. So I don’t have a problem with that at all. The plot summary above is pretty sums up the entire story, but that’s not the point. Malick is solely interested in the human soul, not character or plot. It is a film about how people cyclically seek love and faith, lose them and have to find faith to believe in love again. Priorities shift, desires change, and people are ever-changing. I liked that core message. Malick himself seems to place more hope on faith. I connected more to the love part than the faith part. I stayed with To the Wonder till around the 90-minute mark out of its 112-minute running time, and then I started to tune out from fatigue of having to feel so deeply into an empty canvas. The more you want to walk into Malick’s abstract world, the more experiential the film will be. However, the audience must take that very first step. So for that, it’s more appropriate to view this at home where you can rewind in case you drift out of the film. In context to Malick’s filmography, I would have preferred something to happen in the third act for something to lift itself to somewhere else. Comparing it to his last film Tree of Life, his directorial voice seems to growing more raw and barebones. And for that, my favorite Terrence Malick film remains The Thin Red Line. For anyone who hasn’t seen Malick’s work, perhaps they can start with that one. 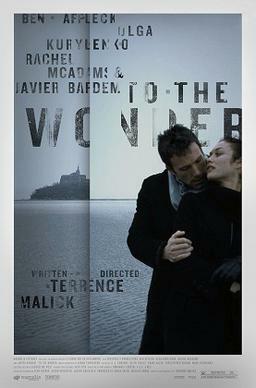 To the Wonder is definitely not for everybody, but I recommend it to any Malick fans.